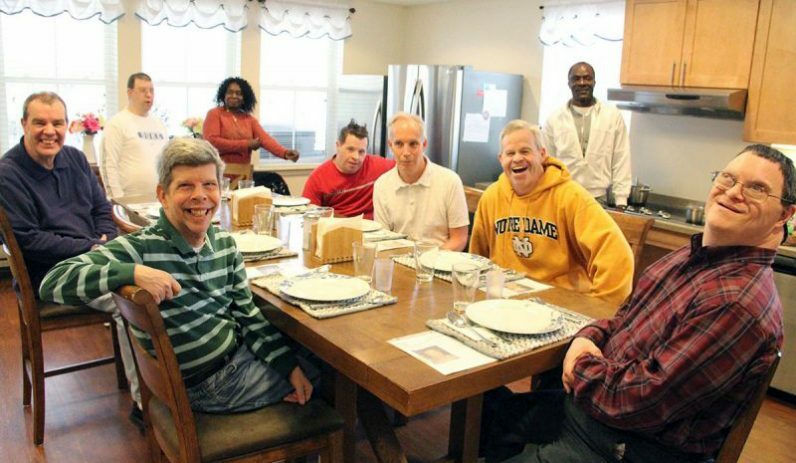 Residents of the Communities of Don Guanella and Divine Providence enjoy living together at one of the small group homes run by archdiocesan Catholic Social Services. On Black Friday stores offer great deals on Christmas gifts, and Cyber Monday does the same for online shopping. But Giving Tuesday flips the script as an international day of giving, not shopping. Held on the Tuesday following Thanksgiving, the international day of charity — often using the social media hashtag #GivingTuesday — encourages everyone to make a donation to their favorite cause. In the Philadelphia region, the Catholic Charities Appeal (CCA) and the Catholic Foundation of Greater Philadelphia (CFGP) are spearheading efforts to encourage people to support vital Catholic ministries. This year CCA has selected the Communities of Don Guanella and Divine Providence as its official beneficiaries for Giving Tuesday. The Catholic Social Services agency serves all individuals with intellectual and physical disabilities through a vibrant community filled with love and care. In partnerships with families, employees and volunteers, the programs provide a continuum of care including community and campus-based living arrangements, the Life Sharing Through Family Living Program, in-home supports, respite care and day programs. This year’s #GivingTuesday donations will provide these programs much-needed assistive technology to help individuals with disabilities progress toward their goals. Some examples include computer applications that provide text-to-speech, speech-to-text, word prediction capabilities and graphic organizers. Visit the CCA website and donate to the Communities of Don Guanella and Divine Providence. Sister Ann Raymond Welte, I.H.M., and Father Liam Murphy lead the ministry team of Mother of Mercy house, an archdiocesan outreach to residents of Philadelphia’s Kensington neighborhood. For the fourth year in a row, the Catholic Foundation is participating by raising funds on Giving Tuesday to support Mother of Mercy House. The archdiocesan ministry is located in the Kensington section of Philadelphia that, while traditionally dealing with violence, deep poverty and substance abuse, has become overwhelmed by the opioid drug crisis raging in the city. Residents of the neighborhood might be forgotten as they suffer in silence, but Mother of Mercy House has not forgotten them. 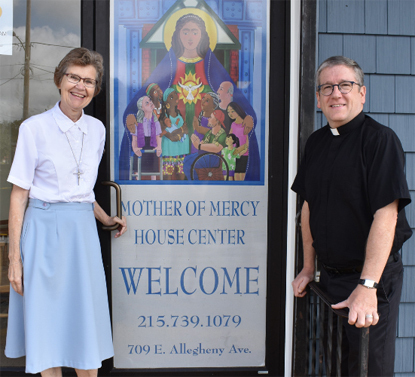 Led by Father Liam Murphy and Sister Ann Raymond Welte, I.H.M., the ministry serves all residents from its location at the corner of East Allegheny Avenue and F Streets, its blue awning welcoming all those seeking a safe haven with a meal and with mercy. Last year for #GivingTuesday, CFGP raised more than $10,000 for the supportive services offered at Mother of Mercy House, including food assistance, clothing distribution and prayer services. Donors also helped raise awareness for the ministry team’s work with those impacted by addiction. This #GivingTuesday, CFGP encourages the Philadelphia community to support Mother of Mercy House as they bring the mercy of God’s love to everyone in the Kensington area. Make a donation to the ministry at the CFGP website or text “mercy” to 215-709-9955. 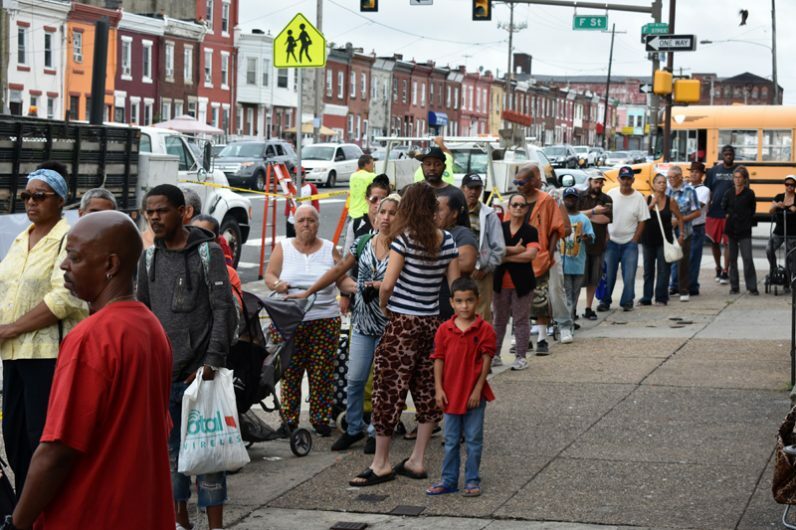 Kensington residents await food distribution at Mother of Mercy House.